"What is it you're doing here? What are you up to?" The Monk finds the wounded villagers somewhere to lie down. 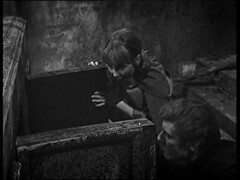 In the cell Vicki & Steven discover a secret passage and figure the Doctor must have used it to escape. The Monk finds his captive gone but is called back to the villagers. The Doctor is in the village where Edith has told him where his friends have gone and about the Viking visitors. Steven and Vicki emerge from the tunnel and seek the Doctor. 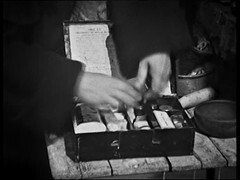 The Monk treats villager Eldred with penicillin for his wounds and pumps him for information on the Vikings who tells them the main fleet is probably two days away. There are two Vikings left in the woods, Sven & Ulf. They decide to assault the monastery and hold the monks hostage. 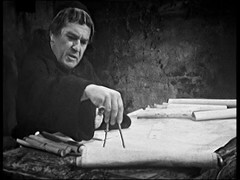 The Monk ticks another thing off his to do list before plotting on a map he has laid out on the altar. Knocking on the door makes him hide the papers, and answering he is grabbed by the Doctor who makes the Monk think he is being held at gunpoint. 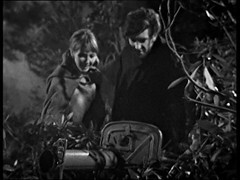 Steven & Vicki arrive at the cliff discovering the tide has come in burying the Tardis. Steven discovers a bazooka set up on the cliff. 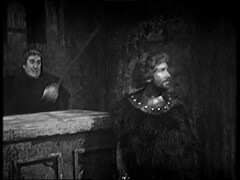 They head back towards the monastery, where the Doctor & Monk are arguing as the Vikings hammer at the door. 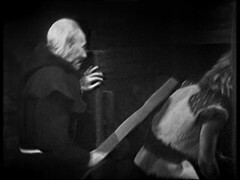 When they answer it the Doctor is overcome as the Monk slips away to overpower Ulf while the Doctor knocks Sven out. 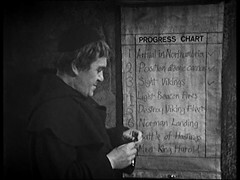 The Monk goes to the village and gets the villagers to set beacons on the cliff tops. 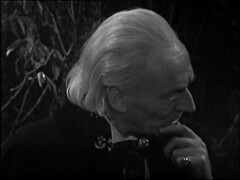 The Doctor captures him on his return and asks him what the fires are for. Superb. 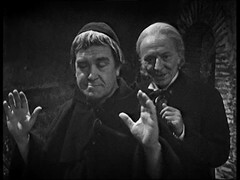 Hartnell & Butterworth are fabulous opposite each other and really make the episode. 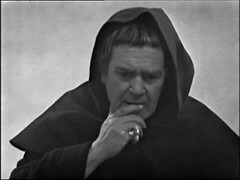 MONK: I thought I'd seen the last of you, Doctor. DOCTOR: Oh, did you now? Well, as it happens, I happen to be a very curious fellow. Yes, very curious. Now then, I have some questions for you and I want them answered. Continue. 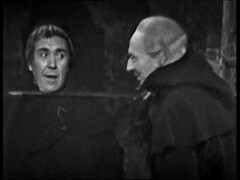 It's evident from this episode that they know each other from before this story with the Monk being surprised at the Doctor's threat of violence and teasing him about how he looks in the habit of a Monk. Item 2 on the list is interesting: it talks about the weapons that Steven & Vicki find on the cliff top before they find it! MONK: You need to swallow these. WULNOTH: What are those, Father? MONK: Oh, it's just some penicillin. It's a sort of herb. 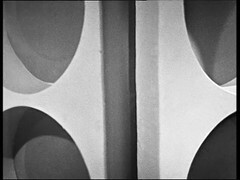 Oh, no more visitors. It's getting it's getting so that you can't call a monastery your own. He does seem to be getting quite annoyed at getting interrupted though! Butterworth was married to actress & impressionist June Brown. While performing in pantomime in 1979 he failed to turn up one day and was discovered dead in his hotel room having had a heart attack following the performance the previous night. 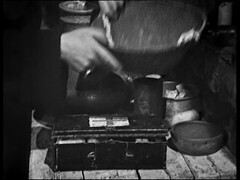 Like episode 1 this episode was recovered from Nigeria with a portion missing: during Sven and Ulf's argument mid episode a ten second portion was cut containing the moment where Ulf urges Sven to kill him. Like episode 1 collector Ian Levine held a complete copy of this episode and that was used to patch the episode for it's 1992 repeat and subsequent commercial releases. The quality of the episode is better than one but is still more grainy and less sharp than episode 2. There's certain points where I can spot repaired damage including tramline scratches. 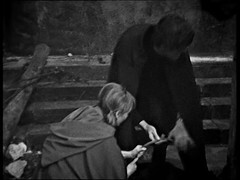 Steven & Vicki discover a cable on the floor of the Monastery leading to a door in the back of the altar. VICKI: It's a Tardis. The Monk's got a Tardis! What an ending! As they walk through those doors you're hit with the familiar console room noise and then pulls back to reveal the roundeled walls. 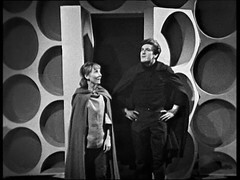 The shock in 1965 of discovering that there was another Tardis out there must have been HUGE. The whole story has been leading up to this moment. How has The Monk obtained all these anomalous objects? How does he know what's about to happen historically? Really the only conclusion you can draw is he's a Time Traveller somehow/ But a Time Traveller with his own Tardis? Huge! It removes the uniqueness of the Doctor's ship to start with and opens up lots of interesting questions. 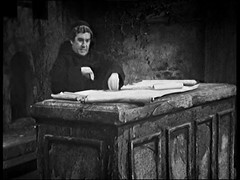 If The Monk has a Tardis then by extension the Monk must be from the same place as the Doctor...... so where is it that? And are there any more like him out there?. 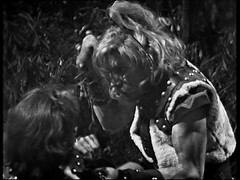 It's a real game changing moment right up there with the first appearance of The Daleks, their reappearance from the Water in Dalek Invasion of Earth and Susan's departure at the end of the same story. 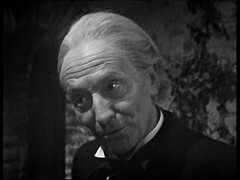 Oddly the Daleks getting time travel feels like a logical step for them to be able pursue their enemy wherever he goes. The revelation that the Doctor's technology, and thus the Doctor, isn't unique is a big jump.